I have always been intrigued by the interaction of color and light, and how we perceive it; I am also fascinated with flying and with views of the sky seen from the sky. The Strata paintings incorporated in this book were inspired by both. The artistic challenge has been to find ways of expressing in my painting what I am experiencing viscerally, as well as visually. Part of that challenge is to find materials that allow me to permanently capture my experience for others. 9” x 14” Plexiglas that is one-inch thick. Each painting is slowly built up with 20-30 layers of transparent pigmented glazes that combine to create a remarkable spectrum of color. 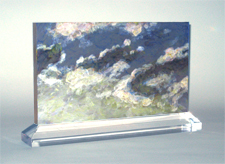 The translucent Plexiglas receives the light and incorporates it into the painting, illuminating the colored layers from within to create an ethereal, atmospheric effect. As this book's graphic designer, I was charged with integrating the written concept with a visual one in a way that is aesthetically pleasing and engaging. I wanted The Book of Comforts to be graphically elegant and to take the reader on a personal adventure, whether bouncing from idea to anecdote, to quote to poll, or cruising pensively through the chapters from cover to cover. I designed each page carefully with this goal in mind, finding the section of each painting that would be best suited to the overall design. It was clear from the start that the Strata series, these “little slices of sky,” as they have been called, served our goal to combine words and art and create something that is not only a comfort to read, but also a comfort to behold.